All of the examples of colored minerals on this page have intrinsic color due to band gaps. In these minerals, electrons can either reside relatively fixed at their normal energy in the valence band, or can be promoted (by light) to a higher energy state in which the electrons are more mobile. 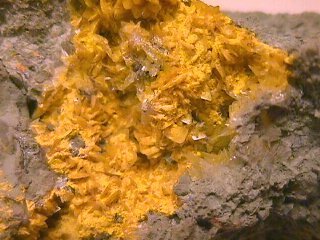 Golden yellow orpiment (25K) from the open pit mine at Boron, Kern County, California, coating colemenite crystals.